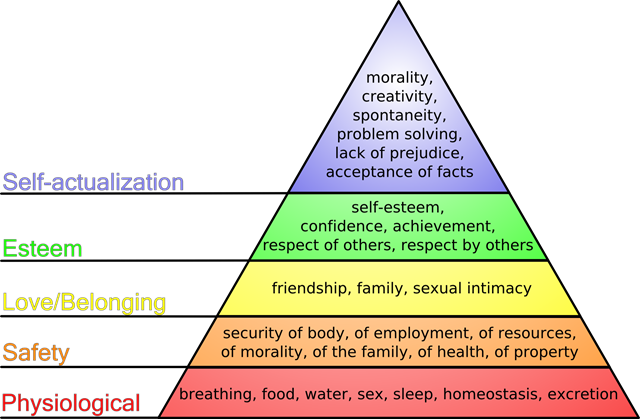 On Sunday I wrote a piece about the “Hierarchy of Needs”, that illustrates a hierarchy of needs that are essential for the emotional and psychological health and survival of humans. In my post, I tried to draw implications to Working Mothers – and through this thinking and comments from others, it seems like there could be correlations between the fulfillment of these needs by “layer” and the life stage of your children. For example, when they are first born, some Physiological needs may have been unmet (e.g., sleep), but as the kids get older and start to take care of themselves, your time frees up and allows you to meet more needs along the pyramid. I’m curious. How are your needs being met along the following dimensions? Note: all responses are anonymous — I cannot even see who is participating in the poll let alone the answers that are given to that person. Do you believe that any unmet needs impact the levels of your health and/or happiness? Do you think you can isolate which parts are partially or not met? Are there things that you can control to help meet those needs?